The program's data is stored in a random access file. The advantage to this type of file is that it can be quickly updated as long as your program correctly tracks the record number. In order to do this, a custom data type is required to ensure each record uses the same amount of memory. The custom data type named PuzzleList is built from three elements: a long integer and two strings. The long integer is an identification number (IDNum), and as you will see, I use it to make finding specific records easier. The two strings will hold the topics and words. The integer variable recNum is still required to serve as a place locator for I/O operations on a random access file. The value of the recNum variable will match that of the identification number which makes it easier to locate and update records in the data file. A variable array of type PuzzleList is declared at module level to be used in reading the data from the file and writing it out to the hidden worksheet. When the form is shown, its Activate() event procedure is triggered and its code calls the procedures that load the data from the file and writes it to the hidden worksheet. The data file's topics are retrieved from the worksheet by passing the dynamic array variable topics to the GetUniqueTopics() sub procedure. The name of the procedure, GetUniqueTopics(), implies its function. Remember that the data file, and thus the hidden worksheet, contains a topic for every word; therefore numerous repeat values for the topic exist. The array is passed by reference, so when it is re-dimensioned and filled with values in the GetUniqueTopics() sub procedure, it can be added to the Combo Box control via its List property (the List property of the Combo Box control is a variant array). The last line of code in the Activate() event procedure sets the topic that will be displayed in the Combo Box control. Be aware that setting the Value property of a Combo Box control triggers its Change() event. The purpose of the GetAllRecords() sub procedure is to load the data from the file and store it in the module level variable array curList. Because the procedure involves file I/O, some validation and error handling code is included. To avoid file I/O errors that may crash the program, first the path to the Workdfind.txt file must be validated and appropriate action taken if the file is not found. The Dir() function serves to validate the file path. The Dir() function is a member of the FileSystem object, but can be used without its object qualifier. In the GetAllRecords() sub procedure, the Dir() function returns the string "WordFind.txt" if this file is found at the specified path. If the file does not exist at the specified path then the Dir() function returns a zero-length string ("") and the GetFile() function is called to display a file dialog and give the user a chance to find and select the file to open. If the user finds the file and selects OK, then its path is returned to the variable filePath. If the file's path is not found and the user selects Cancel, then code execution continues. The second step in avoiding a program crash from a file I/O error is adding an error handler. Although it is difficult to foresee errors other than an invalid path and/or file name, certainly more possibilities for file I/O errors exist (for example, a corrupt file); therefore, the error handler is added to display a message box indicating the nature of the error and end the program. The error handler is also called if the file path is invalid and the user chooses to cancel the file dialog used to find the file (this returns an empty string for the file path). I handle the error this way because of the difficulty in predicting what error might occur. All I know is that the Open statement has failed, so the program must end. Most importantly, the error handler prevents the program from crashing and starting the debugger. Normally, I would place the call to the GetFile() sub procedure in the error handler, but the Open statement does not fail if a valid path is used and the file is not found at this location. Instead a new file is created and that's not the required action. 'Load all records from random access text file into 'variable array of custom data type. On Error GoTo FilelOError filePath = ActiveWorkbook.Path & "\Wordfind.txt"
'Open the file and fill records into custom 'variable array. 'Use error handler for unforeseen errors. The GetFile() sub procedure is only called from the GetAllRecords() sub procedure when the data file is not found at the specified path. The procedure shows a FileDialog object to allow the user to search the computer's file structure in order to locate the file. If the user locates the file and clicks the OK button, then the file's path is returned to the calling function. 'Configure and show the open dialog. 'Return path to calling function. .Title = "Select Wordfind.txt File"
The data is written to a hidden worksheet named Lists that is in the same workbook as the Wordfind puzzle worksheet. After the sheet is cleared, the topics, words, and identification numbers are copied to the first three columns of the Lists worksheet from the module level variable array curList (this variable was initialized in the GetAllRecords() sub procedure) using a For/Next loop. I qualify the Lists worksheet with an object variable (ws) because it is never the active worksheet. The last statement in the procedure sorts the data alphabetically, first by topic and then by word. This is the major reason I write the data to the worksheet—to take advantage of its fast sorting capabilities so the data is listed alphabetically in the ActiveX controls. Furthermore, when the topics are sorted alphabetically, it's easier to pick out the unique values from the list. Note that I passed the Sort() method of the Range object several arguments. They are all optional, but at the very least, Keyl and Key2 must be included in order to specify the primary and secondary keys on which to sort, which in this case, are the topic and word, respectively. I also included the MatchCase argument to specify a case-insensitive sort. You can also pass the Sort() method arguments that specify the sort order for each key (Orderl, Order2), whether or not to ignore a header row (Header), whether to sort by rows or columns (Orientation), and whether or not to treat numbers as text for each key (DataOptionl, DataOption2). Excel worksheets are hidden and unhidden by selecting Format, Sheet, Hide/Unhide in the application window. When the user selects a new topic, the Change() event of the Combo box is triggered and the List Box is updated with the words associated with the selected topic. This event is also triggered from the Activated event of the UserForm object when the List property of the Combo Box is assigned the values in the variable array topics. The words are added to the List Box by the GetWords() sub procedure which reads the values from the hidden worksheet. 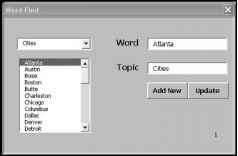 'Add word list to list box associated with 'topic on combo box. Label control serves as a convenient location for storing the number of the record currently displayed on the form. The record number is required for updating the file so it can simply be read from the Label control when the user selects the Update button. If you like, you can set the Visible property of the Label control to false to prevent the user from seeing the record number. Figure 7.18 shows an example of how the form appears when a word has been selected from the List Box control. The update form from the Word Find program displaying a user-selection. 'Loop through columns A and B in Lists worksheet to find 'the correct topic and word and then return ID number. To add a new record to the data file, the user must simply enter values for the topic and word before clicking the Add New button. Calls to the AddRecToWorksheet(), AddToControls(), and AddToFile() sub procedures update the hidden Lists worksheet and the ActiveX controls, and add a new record to the data file. Note that a new ID number must be assigned to the new record. The code in these procedures should be familiar to you. 'If nothing in text boxes then exit the sub. 'Add the new record to the Lists worksheet, the file, 'the List box, and the combo box. 'Update the "Lists" worksheet with the new record. 'Update the controls on the Userform. 'Update topic only if its new. 'Add the new record to the random access text file. 'Use error handler for unforseen errors. Updating the data file is a bit trickier. Care has to be taken to ensure the correct record in the file is overwritten. This is where the Label control becomes so convenient because its Caption property holds the number of the currently displayed record. A record is updated when the user clicks the Update button, presumably after editing an existing word from the list. The Click() event procedure of the Update button updates the Lists worksheet, the ActiveX controls, and the data file with calls to UpdateWorksheet(), UpdateControls(), and UpdateFile(), respectively. Note that the topic is validated before the record is updated because the program requirements specified that no updates to the topics are allowed. 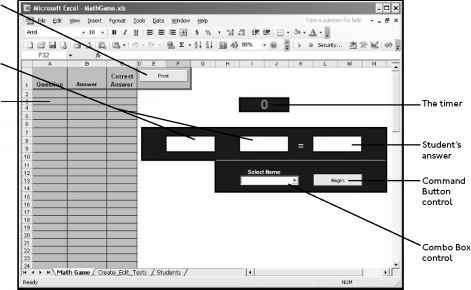 'Update record in worksheet, controls, and text file. 'Only allow updates to the word and not the topic. 'Update the list box containing the words. The last procedure listed in the code module for the UserForm object is the QueryClose() event procedure that is simply used to hide the form. Because the GetUniqueTopics() sub procedure is called from the code modules for the UserForm and the Worksheet objects, I entered it into a standard code module and gave it public scope. It is called from the Activate() event of the UserForm object in order to retrieve the unique values for the topics listed in the Lists worksheet. The variable array topics is passed by reference and filled with the unique topics from column A of the worksheet. 'Loop through column A in Lists worksheet and find 'all unique topics.